The Wikivoyage dabblings of a Londoner. See Licensing menu for details. In under six months, the tenth annual Wikimania will be held in London, in the nigh post-apocalyptic, brutalist Barbican estate. In preparation, Wikivoyage have been building a special Wikimania 2014 guide, now in a somewhat useable form (with similar pages being constructed in Mandarin and Spanish). This is the first mainspace page to which I made a significant contribution and I think it’s turning out quite well. I’ve actually learned a lot about the city (and, for that matter, The City) from helping here. The guide should cover everything else to see and do around the conference, which run the gamut from Roman relics and medieval churches to the world’s first website—coincidentally, on display in the same building as Wikimania, along with a Digital Revolution exhibition. You could have a burger and milkshake at a halal diner or a beer in one of the (tenuous) claimants to the title of “oldest pub in London”. Those staying on could even visit the World Science Fiction Convention and the Great British Beer Festival, both taking place in the following week. On the highwalks around the Barbican Estate. The guide isn’t finished yet and it’s already looking like a great August. With reference to my earlier post about enlightened self-interest, this is the sort of thing that got me interested in the ‘voyage project. Working on a guide like this, I’m not only helping to make other people’s lives richer but I’ve also found new things to enrich my own. Well, I think so anyway. It has the look of a set from a 70s sci-fi movie about a totalitarian dystopia. The fact that this area has actually been abandoned once and completely destroyed twice in its history helps too. 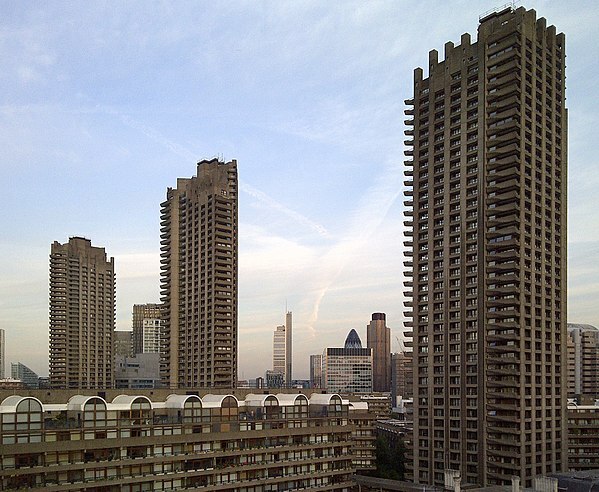 The brutalist towers of the Barbican dominating the local skyline. The South Bank is the tip of a peninsula of the Thames in central London and one the the city’s cultural centres. It is a small area but it contains many artistic and creative sites, as well as an eclectic range of other attractions, boutique shopping and trendy food and drink places. The size of the district, as well as the pedestrianised area along the bank of the River Thames called “Queen’s Walk” (part of the Thames Path), make is ideal for exploring by simply strolling around. 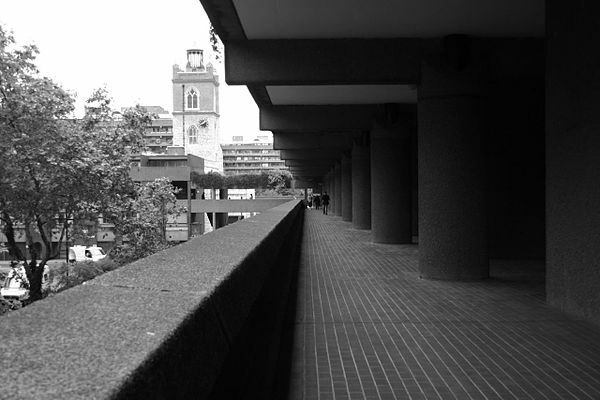 South Bank is a district of central London. It isn’t much but writing this is a different experience for me. It doesn’t come up often on Wikisource and any leads I write on Wikipedia are much more formal (and I often just write a sentence or two for each item in the Table of Contents and call it a day). Writing something vaguely enticing is new. I also did an almost complete rewrite of the “Understand” section about the area. 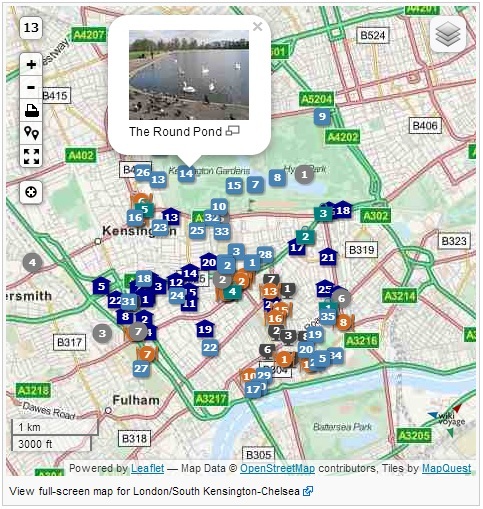 I’ve been working on South Bank (in a departure from my usual South Kensington & Chelsea work) geocoding the existing listings because it’s a simple task that I can do in a spare moment. I haven’t been able to scrape together enough time to do many larger tasks lately so these microtasks are a way to still get something done. I may have jumped the gun on the mapmask but I think the boundary idea is sound. I can always incorporate the masks in the future when they’re ready. Some district boundaries are easier to decipher than others. The little ones like Soho, Leicester Square and Covent Garden are clearly defined by roads, so they’re simple to understand and easy to trace from Open Street Map. Hammersmith and Fulham appears to be the borough of the same name for the most part, except there is a chunk carved out around Olympia and something odd happening in the north. I think railways and canals are involved as nothing else seems to explain the northern deviancy. It was easy until this section turned it into the hardest I’ve tried to set up so far. Holborn-Clerkenwell is also an odd shape but at least seems to follow some sort of logic, albeit skipping between different borders and roads more-or-less at random. It was harder than its western neighbours but relatively straightforward once the logic of it had clicked. I’ve already noticed some errors I’ve made in placing listings between districts, so I am convinced that doing this has value. It should be especially useful for casual users: adding a listing to Wikivoyage is probably the easiest microtask in all of the Wikimedia sorority but, if I’m having this problem even after trying to decipher the district map, then I expect it to be worse for others who have just turned up at a page for the first time. A problem I’ve encountered a few times since beginning my attempt to upgrade all of the London guides on Wikivoyage is the boundaries of districts. 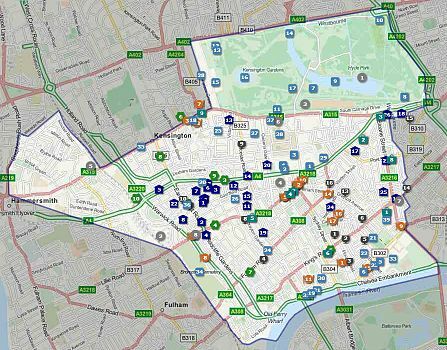 In particular, checking the project’s Inner London map against each guide, it’s often hard to reverse-engineer the logic behind these divisions. This makes it hard to decide on which guide a listing should be placed. It certainly seems to have confused past editors, as I’ve found several misplaced listings so far and a few duplicated ones. A chance discovery looks like it can fix that. While checking some details with an eye towards my first itinerary, which may not be up for a little while yet, I noticed the “Adding boundaries and tracks” section of How to use dynamic maps (which I have read before but never really noticed this bit at the end). Apparently, I can use a GPX trace to draw a border around the area on the attached dynamic map. Possibly the reason why I didn’t get this earlier is that it is largely unused at the moment: there were only sixteen maps (guides and itineraries) on the project using this function before I added my own. South Kensington-Chelsea map with the boundary. Then, while exploring this system and trying to understand it fully, I came across another, complimentary function: the mapmask template. It took a while to understand it; I thought the effect was generated by the previous function in some way but couldn’t work out how. Eventually I found the template concerned. This is actually used on fewer guides, eleven instances, and not all the same instances as the boundary trace. The template uses the same GPX information but alters the map to slightly grey-out everything outside the boundary. South Kensington-Chelsea map with the boundary and the mask. I think it looks quite good, and leaves no doubt about what’s inside or outside the district. They could be used apart but I’ve used both for now, just in case. I intend to roll this out to every guide for London eventually, although reverse-engineering the actual border from the map took a while here (it mostly follows the borders of the borough for a while, but leaves out half of it for another guide and annexes parts of Fulham and Westminster). It might be even harder for some of the others. I’ve found Cope to be the most confusing of the standard guide headings. Most of the others are fairly intuitive… usually. Buy could be subtitled “List shops here”, Sleep could be “List hotels here”, and so on and so forth. Cope might as well be “Dump anything else here”. At the moment I’ve put in some general supermarkets and emergency services (an urgent care centre and a police station). The other suggestions remain a problem. I have absolutely no idea what babysitting services exist in South Kensington and Chelsea, for instance. There are a few thing I have found that match the list above but I’m not sure how useful it would be to, for example, list every individual public toilet, complete with geo-coordinates. These things seem like a job for Google. Looking at star guides for pointers doesn’t necessarily help. Very few guides seem to bother having a Cope section at all. The contents are so generic that I can’t imagine it was for lack of potential listings, so maybe it just isn’t seen as important. I’d like to get each district in London as complete as possible but it might not be worth coping at all. I like the page banner concept. It reminds me of the header templates on Wikisource and the image sets the tone for the guide. They’re quite easy to make too, just a crop in GIMP, as long as a suitable image is available. With those I’ve done so far I often make a few and discard the rest, although I uploaded three for Lambeth because I couldn’t decide which was the best least worst. I wasn’t sure about uploading this one. While I think it accurately conveys Tooting, it might not be the most enticing of images to attract travellers. I could have probably used Battersea Park, possibly with the Peace Pagoda at an attractive point a third of the way from the far right. 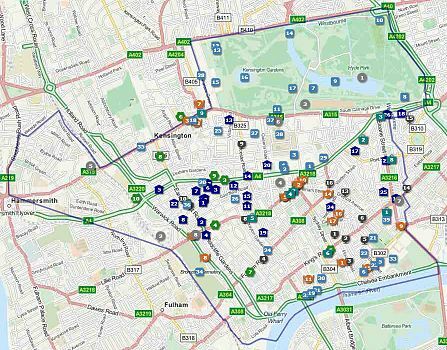 However, several of the London districts are already represented by images from parks, which is fine on an individual basis but, taken as a whole, is going to give a slightly skewed impression of London. Presumably people travelling to the city expect it to actually be a city. I feel this banner at least has some south-of-the-river authenticity. I’m a bit stumped for some of the other districts. The East End, Holborn, Islington and Southwark (as well as the East and West of Greater London) are all still running with the default page banner. Islington might be the hardest. I have ideas for images for the others, I just haven’t found the right images yet (and I might end up going out to take a few photos to fix that). I’m not sure what could or should represent Islington, though. Too many dots on the map? The South Kensington-Chelsea dynamic map in its current state. I chose South Kensington-Chelsea as the destination article to work on first (that would be The One with the Museums to non-Londoners). It was already a developed guide, albeit only rated as “Usable” status which in Wikipedian terms is somewhere between start class and (maybe) B class. After adding latitudes and longitudes to all of the existing listings (which was moderately tedious, although getting easier), adding some new listings and adding a version of the dynamic map I found on the guide to The City, I’m worried there may actually be too much stuff there now. The slippy, dynamic map is covered in overlapping coloured dots. This could seem a little busy. I think it looks OK on the larger map but at this level of zoom the sea of points of interest might be overwhelming. The sections themselves are mostly at or exceeding the recommended 7±2. Hopefully sub-bullets don’t count towards that limit. I have already split up “See” a few times but it might need yet another subsection. Possibly for street furniture. I still want to add a few points, like an old postbox. Luckily there doesn’t seem to be that much to do in the destination. Conversely, there are a lot of places to sleep and certainly a lot more that could be added, although the current selection is probably sufficient for now. The guide doesn’t even have a “Cope” section yet and “Connect” could be expanded. This risks a wall of coloured dots instead of a functional map. I often think I should see more of London, seeing as it is literally on my doorstep, but often don’t. I must admit that I am using Wikivoyage for my own selfish reasons. Editing Wikivoyage gives me an excuse to actually do things that I’ve often thought of doing anyway. Having a specific, concrete ulterior motive seems to help. At least, a specific goal, rather than the nebulous “see more things”, allows me to focus and actually get around to seeing those things, which I have otherwise put off until now. I’m a moderately experienced Wikimedian but I’ve only recently started dabbling with Wikivoyage, the travel guide that was adopted into the same family as Wikipedia, Wikisource, Commons et al. I thought it might be amusing to record and narrate some of my fumblings. I might include some local wiki stuff here as well, if it fits, but this is mostly intended for Wikivoyaging.